Origin and Habitat: Coryphantha macromeris subs. runyonii has a small disjunct range along the lower river-course of the Rio Grande, at sea level, between Brownsville and Rio Grande City (Texas), and a parallel range on the opposite river side in the Mexican state of Tamaulipas. Altitude range: It occurs only near sea level on the plain of the Rio Grande. 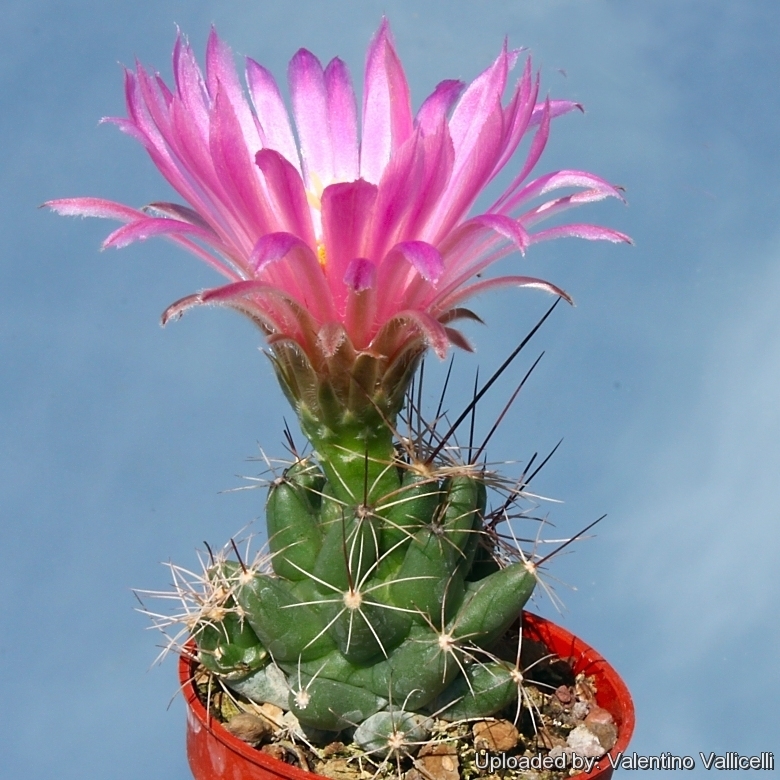 Lepidocoryphantha runyonii (Britton & Rose) Backeb. 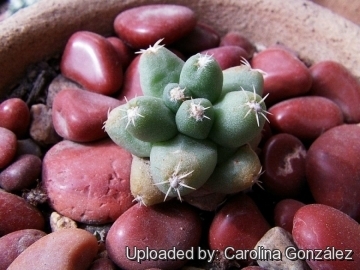 Coryphantha macromeris (Engelm. in Wisliz.) Lem. 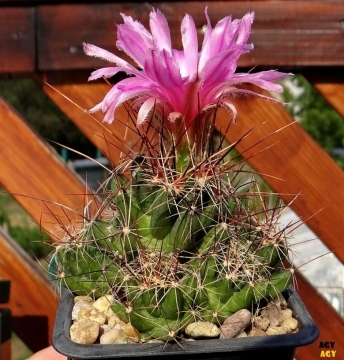 Lepidocoryphantha macromeris (Engelm. in Wisliz.) Backeb. Mammillaria macromeris Engelm. in Wisliz. 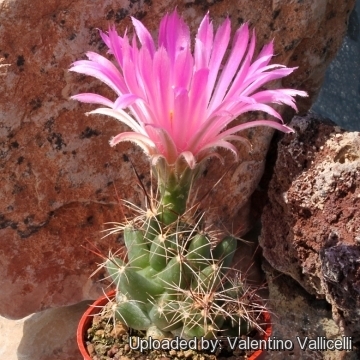 Description: Coryphantha macromeris is small plant profusely branched with long projecting spines, ultimately forming low mats or hemispheric mounds to 100 cm diameter. The ssp. runyonii is distinguishable for the grey-green stems up to 7.5 cm high and tubercles to 7.5 mm long. Root: It has deep succulent taproot often massive and large. Fruits: Dark green, ovoid to obpyriform or ellipsoid. 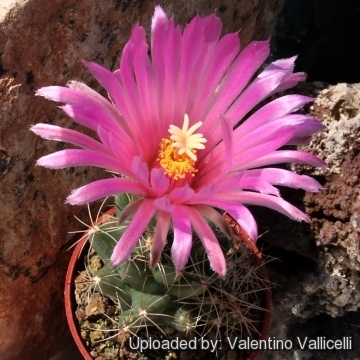 Remarks: The flowers of C. macromeris are virtually identical to those of Mammillaria wrightii and Escobaria vivipara: in the absence of vegetative material, flowers may be unidentifiable. 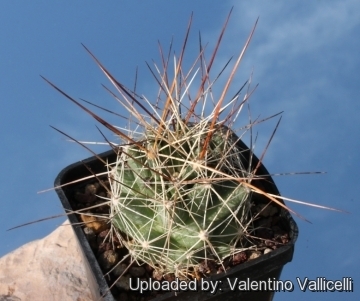 Coryphantha macromeris (Engelm. in Wisliz.) Lem. : (subsp. macromeris) has green stems up to 15 cm tall and tubercles up to 15 mm long. Distribution: USA(New Mexico, Texas) and Mexico (hihuahua, Coahuila, Durango, San Luis Potosí, Tamaulipas and Zacatecas). Coryphantha macromeris subs. runyonii (Britton & Rose) N.P.Taylor: has gray-green stems up to only 7.5 cm tall and tubercles up to 7.5 mm long; It is found near sea level on the plain of the Rio Grande. 1) Heil, K., Terry, M., Corral-Díaz, R., Lüthy, A.D. & Dicht, R.F. 2013. Coryphantha macromeris. The IUCN Red List of Threatened Species 2013: e.T152811A681352. http://dx.doi.org/10.2305/IUCN.UK.2013-1.RLTS.T152811A681352.en. Downloaded on 04 April 2016. 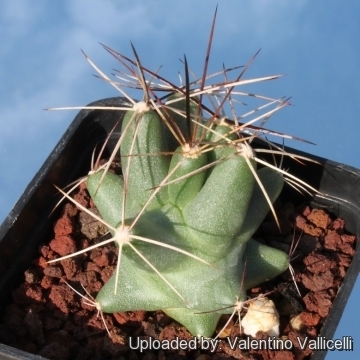 Cultivation and Propagation: Coryphantha macromeris subs. runyonii is popular with collectors and easy to grow. It comes from an area of summer rainfall. Keep drier in winter (but for outdoor cultivation it is quite resistant to wet conditions, too). Very cold resistant, hardy about to about -10° C, but the frost resistance varies a lot from clone to clone. Needs good drainage. Keep drier in winter, Full sun to partial shade. 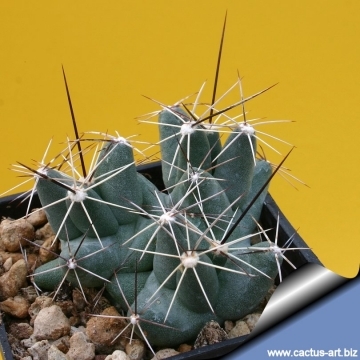 Use and Trade: There are reports that Coryphantha macromeris (and in particular the subspecies runyonii) is collected for use as a hallucinogen. However, there is some debate about its psychoactive properties as the species does not contain mescaline like peyote, but instead has normacromerine, an analogue of epinephrine which seems to have potential hallucinogenic properties (Anderson 2001). This species may be used ceremonially in Mexico by the Tarahumara. Propagation: Seeds (no dormancy requirement, they germinate best at 25°C) or by offsets (if available), or occasionally grafted.